This is a B-Stock item which means the outer packaging could be tarnished or may have been used for display purposes. As this is a B-Stock item please be aware that the product may have some minor marks or signs of light use. 1 year warranty included. 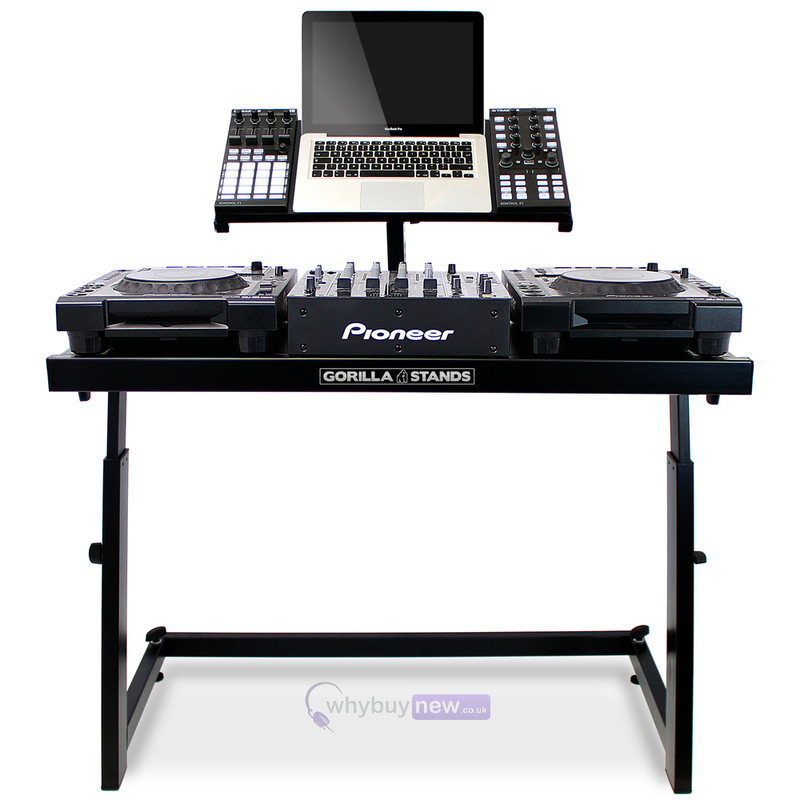 The Gorilla DS-1 is the ultimate DJ deck stand and is a must have for any DJ with a home set-up. This incredible stand is constructed from the highest-grade steel and comes in a stunning black finish! 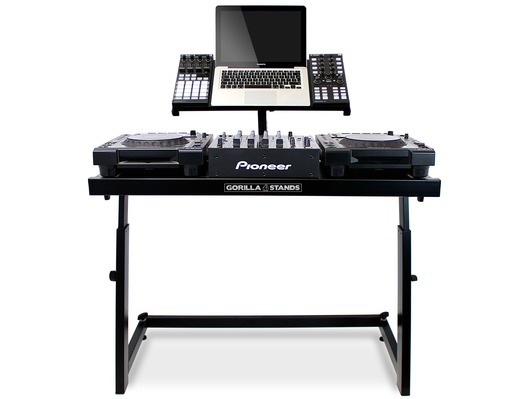 The Gorilla DS-1 has been designed for DJs, by DJs so every detail has been cleverly thought out. 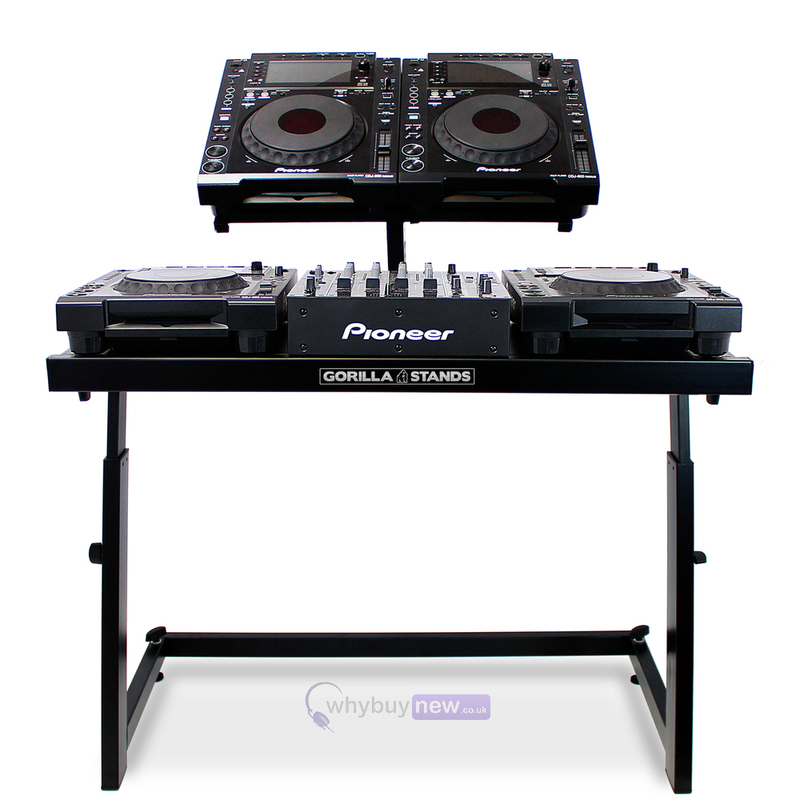 We all understand that having a mix can sometimes last for hours so being comfortable at the decks is the number one priority, that's why the Gorilla DS-1 is fully height adjustable meaning it can be positioned at the perfect height for you to access your equipment and no more bending over, bad backs or over stretching, just your equipment where you want it. 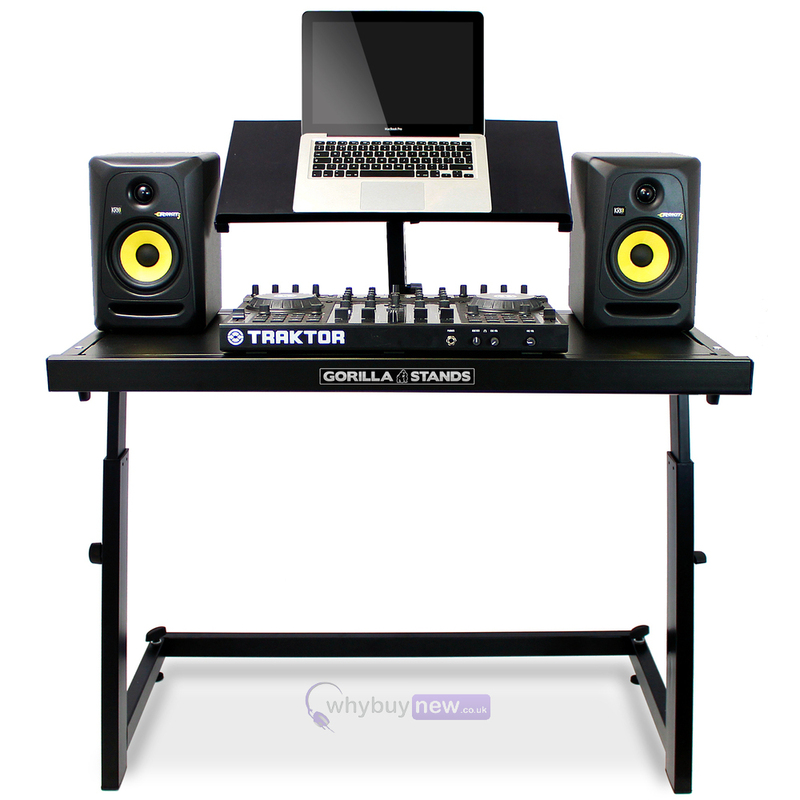 This stylish and robust DJ stand won't look out of place in any surrounding whether it's in your lounge, bedroom or studio. The Gorilla DS-1 is big enough to comfortably fit a pair of either vinyl turntables or CD decks along with a mixer and is also ideal for digital setups meaning that the majority of DJ's are well catered for. The DS-1 sets itself apart from other deck stands on the market by coming complete with an adjustable top equipment bracket which is ideal for laptops, CDJs and DJ controllers! PLEASE NOTE: This listing is for the stand only and all other equipment pictured is not included. No instructions so had to find YouTube video to assemble it. I know this was a B grade item but seriously! The stand when assembled leans to the side, the top is warped so my equipment doesn't sit flat! Don't waste your money on this item! £89 wasted in my opinion. Came without instructions but easy to set up, A very strong and sturdy table, very happy with it, The only problem was it come with one broken plastic cap is not the fault of the product, it happened in transit, I contacted where I purchased it from, and was more than happy to replace the end caps for me. Would recommend to any mobile disco Dj. Came without instruction but easy to put together and it's well made, very happy with the gorilla DJ stand. Came without instructions so I had to search for a YouTube tutorial. Also some of the bolts don't seem to fit properly as I've tried to screw them in but a few have threaded as I've tried to screw them in. But... now it's up its a very good stand. Good height too for me as I'm 6 foot 3 so no bad back anymore! This product is a solid and well made stand and easy to assemble, well pleased with all my Gorilla items. We are a mobile disco operator in N.Ireland - This stand is used amongst other Gorilla and ADJ booths in our weekly discos. This stand is very very well made - thick steel, Quality table surfaces and is everything you would expect from Gorilla's strong reputation. 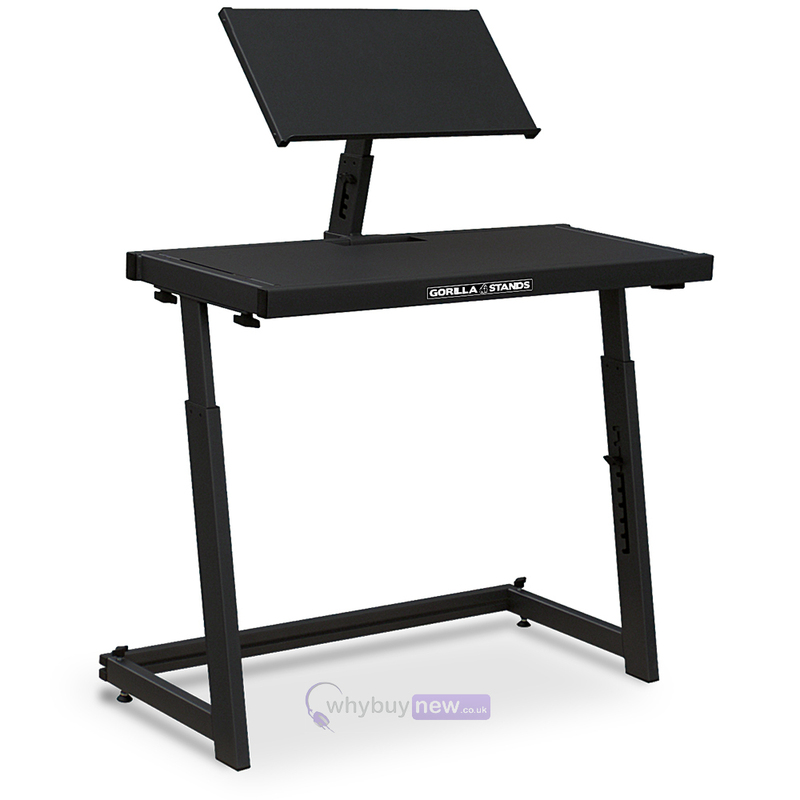 Buy with confidence if you want a high quality dj stand that gives your set-up total ease of access while at home or on the road.